Many things happened in the last 6 months, and we have to apologize for being slow with the updates. – Johannes was on a visiting professorship at Ohio University for 2 months in spring, hosted by Don Miles. It was a great time! – Afterwards, Johannes and Christy worked with Don, Barry Sinervo and Fausto Mendez in Baja California and collected some live Bipes. Very cool to see these critters alive. – And Martin Kirchner defended his M.Sc. thesis. Congratulations! Posted in Uncategorized on September 6, 2014 by muellerlaboratory. 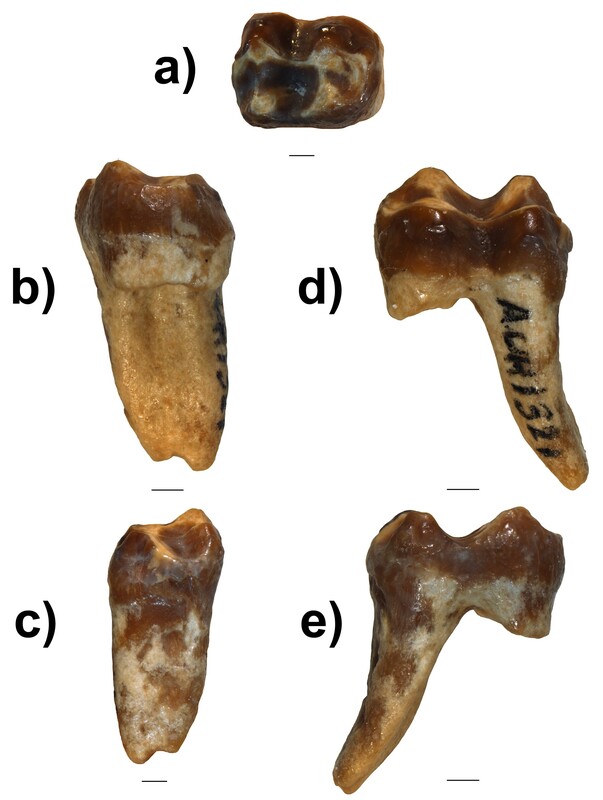 Our team has just announced the discovery of a cheek tooth of a fossil monkey from the Al Gharbia region of Abu Dhabi Emirate, United Arab Emirates. This research is published today in the prestigious journal Proceedings of the National Academy of Sciences. The fossil monkey tooth just moments after discovery. Shuwaihat, 2nd January 2009 (photo: Brian Kraatz). From anatomical comparisons, we determined that the UAE fossil monkey was related to the ancestors of living guenon monkeys. Guenon monkeys are today known only from Africa south of the Sahara, and are especially diverse in the rain forests of Central and West Africa. Interestingly, guenons were only known from a scant fossil record as old as 4 million years ago, and only from Africa. Until now. At around 7 million years old, the Al Gharbia fossil monkey is the oldest guenon monkey known in the world, and the first record that guenons ever ranged outside of Africa. 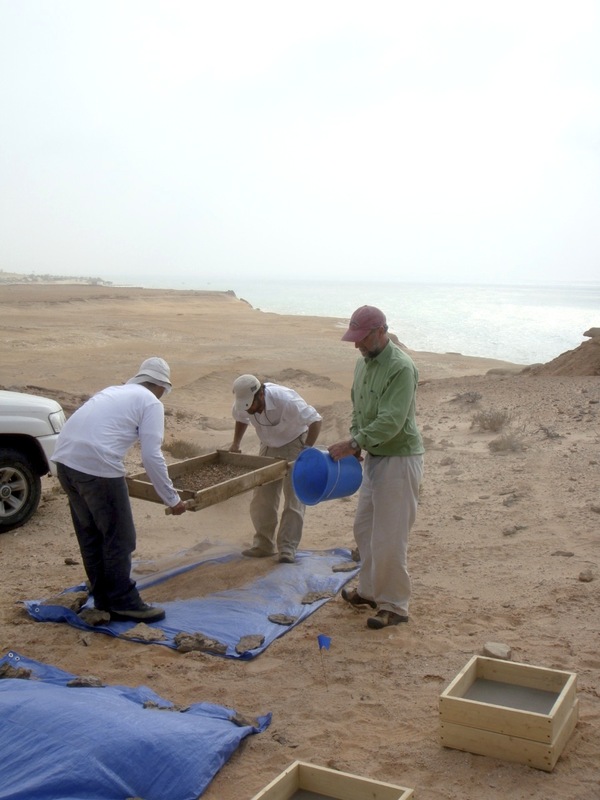 The discovery of a fossil guenon monkey in the U.A.E. offers another reminder of how different Arabian climate and environments must have been 7 million years ago. The presence of rivers and woodland areas fits with our team’s previous discoveries of fossil hippopotamus, crocodiles, swamp rats, fish, turtles, and other water-loving animals and even fossil tree trunks in the Al Gharbia region. 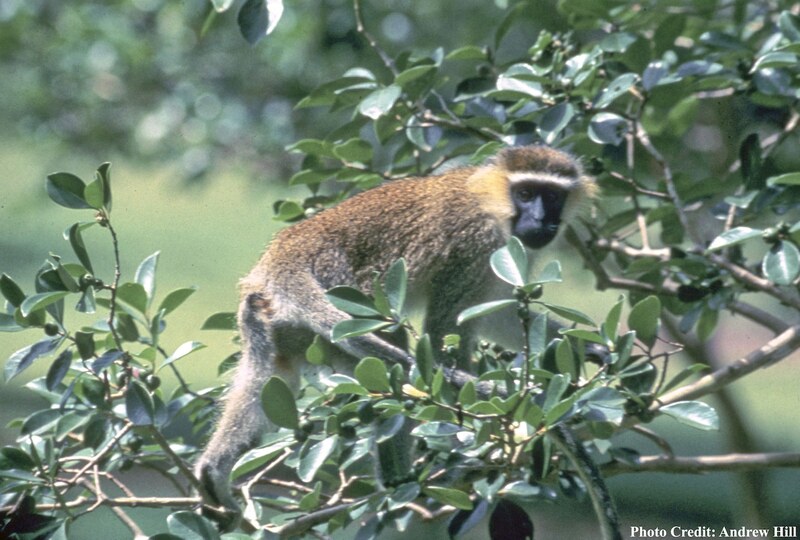 The vervet monkey, a living guenon that is widespread in sub-Saharan Africa today (photo: Andrew Hill). The Al Gharbia fossil guenon is only the second specimen of a fossil monkey known from the entire Arabian Peninsula (the first is also from Al Gharbia but was less informative). The fossil tooth is very small (just over half a centimeter in length) and was found by our team on the island of Shuwaihat. We were in the process of sieving through sands looking for tiny fossils such as rodent teeth and snake bones. We estimate the body mass of the Al Gharbia fossil monkey to have been between 4 and 6 Kg, which is similar to many guenons living today. Our team sieving the sands for remains of tiny fossil animals. Shuwaihat, 2nd January 2009 (photo: Mark Beech). Though it is only known from a single tooth, the Al Gharbia fossil guenon provides compelling evidence of the existence of these animals in Arabia in the past, far beyond their modern-day range. It also highlights that monkeys living seven million years ago had no problems dispersing between Africa and the Arabian Peninsula. This matches with the many fossil antelopes, hippos, crocodiles, rodents, giraffes, elephants, and carnivores that we have found in Al Gharbia to date that also indicate strong and continuous faunal connections with Africa. 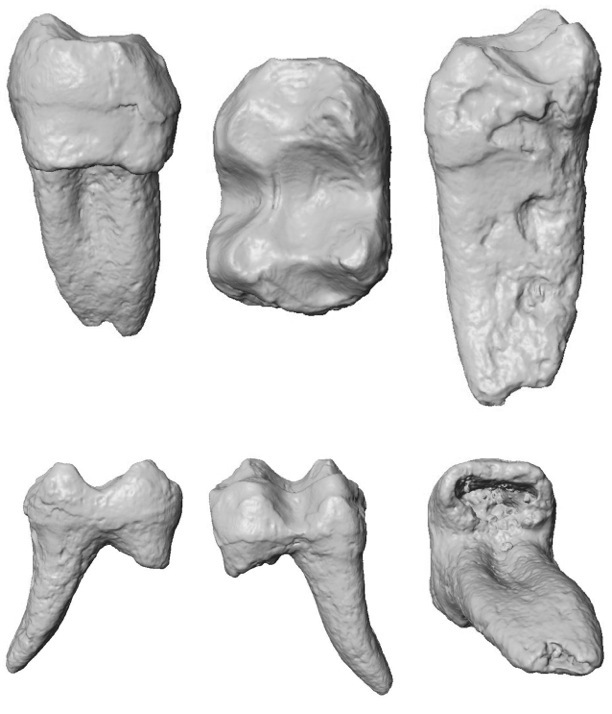 CT scans of the fossil monkey tooth in different views. 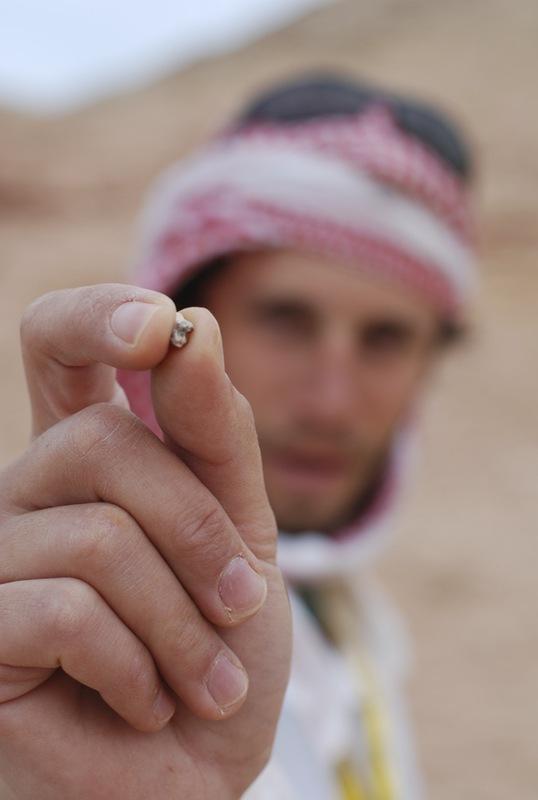 The tooth is just over half a centimeter long (photo: Christopher Gilbert). Abu Dhabi Authority for Tourism and Culture Arabic language press release here. Johannes’ talk that he gave at the Museo Nacional de Ciencias Naturales in Madrid in November 2013 is now online. You can watch it here. Faysal Bibi joined the lab for the coming years. Welcome to Berlin! Former labmate Linda Tsuji published her work on the pareiasaur Deltavjatia, which she carried out in Berlin as part of her Ph.D., and got the cover. Congratulations! Gabi Sobral – best student article in JVP! A follow-up to Gabi’s award notification: here’s a pic with her official certificate, handed over at the 2013 SVP meeting in Los Angeles. Congratulations again! Posted in Uncategorized on November 18, 2013 by muellerlaboratory.